And, if you care, The Meek is starting up on Chapter 5 this week~ next update on Friday for that stuff, and another update or two here this week as well. He hasn’t gotten rid of Shoulder Companion yet. Relative of thigh friend perhaps? I have no idea what that thing in the water is. Something tells me LEVi isn’t supposed to be in the water… Mike is going to have to find a giant bag of rice to but him in, it worked for my cell phone! Now is his chance to get revenge by turning those tentacles into rope. Mike, you’ve had a bad influence on LEVi’s AI. Mike sure loves that robot. I don’t think I would ever go running to meet a machine. It’s OK Mike. Your heart will go on. 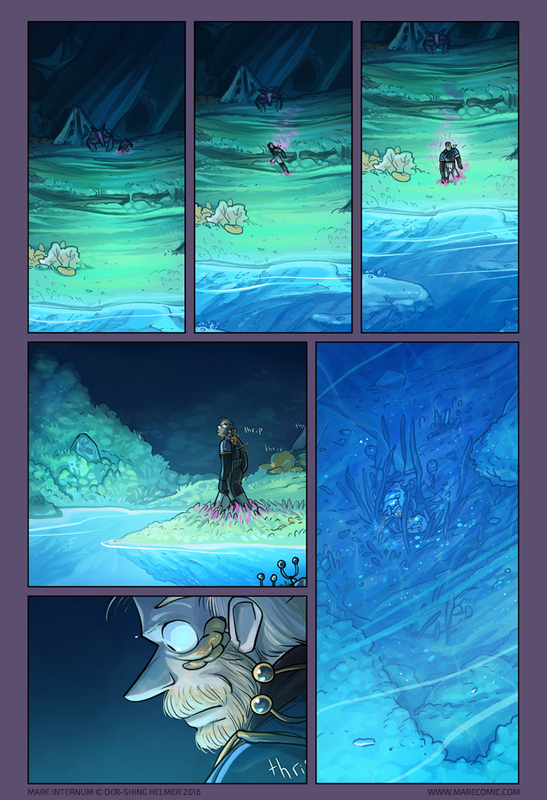 …(remembering first page of Mare Internum)… uh, no? I love how perfectly you captured the feeling when something you’ve been working on for a long, long time is suddenly borked. I can’t help but wonder if Mike’s feelings for LEVi go beyond “project car”. It’s an intellect that he can talk to, that he understands and that will never try to control him. When Mike told Bex he wasn’t straight, maybe he meant he’d given up on *human* companionship. … maybe I’m just reading too much into it. Der-Shing’s been hinting that Mike’s words were unreliable in that scene. He could be anything, really. I don’t think he’s a robosexual, but I do think that LEVi was one of his honest “friends.” Sort of like how dogs can stabilize mentally ill people, because dogs are less likely to trigger paranoia than humans. Also, dogs and robots can stay with people, while human beings need lives of their own. Now that Levi’s been found Mike needs to go get Bex. so wait, der-shing, are those creatures called thrips? I remember in chapter 2 page 28 you said that they “are not thrips calling their own name” so I thought they were called something else….or have you just fallen prey to the comments section and called them thrips anyway? I have fallen prey XD I lack something better to call them at the moment but that will change in a few pages. ah yes….stage 1 is complete.. Interesting that in the previous cavern, we could see the water level had dropped due to the erosion lines at the waters edge. No such signs in here (but I love the ‘undercut’ just below the surface).